Background Junior doctors commonly prescribe inhaled medication for patients admitted to hospitals, and this may be a potential source of prescription error. 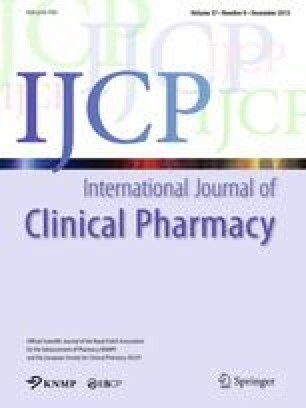 Objective To determine the potential type, frequency and cost of prescription errors for inhaled medication, and ascertain if a simple educational intervention can improve junior doctors’ knowledge and reduce these. Methods We carried out a prospective study looking at the types and cost of inhaled prescription errors. Simultaneously we tested knowledge of junior doctors’ using a quiz. Both the studies were carried out before and after the introduction of inhaler flash cards (pictures of devices with, instructions on use and the medication they contain) on specific wards. This was followed by an electronic feedback survey. Results Error rates varied greatly (p = 6.8 × 10−8) by device, with 23 % of Evohaler and Accuhaler prescriptions being incorrect. The average cost of an erroneously prescribed medication was £45.50. There were 14 % incorrect prescriptions before the intervention. There was no significant improvement in junior doctors’ knowledge of inhalers or the rate of prescription error after the intervention. Conclusion Prescription errors of inhaled medication are common and costly to rectify. There is a need for improved teaching and training of junior doctors and medical students. The online version of this article (doi: 10.1007/s11096-015-0198-9) contains supplementary material, which is available to authorized users. We thank the wider respiratory team for their helpful suggestions. We did not receive any financial support for this project. Seher Zaidi confirms that neither of the authors have had any support from any organisation for the submitted work. We do not have any financial relationship with any organisation that might have an interest in the submitted work in the previous 3 years. Also we do not have any other relationship or activities with any organisation that could have influenced the submitted work. Trueman PP. Evaluation of the Scale, Causes and Costs of Waste Medicines. November 2010 [10/7/15]; Independent Report commissioned and funded the policy research]. http://discovery.ucl.ac.uk/1350234/1/Evaluation_of_NHS_Medicines_Waste__web_publication_version.pdf.